It’s a new year, and that means more people are hitting the gym in the hopes of making a sustainable lifestyle change. With everyone making New Year’s resolutions to get healthy, it made us think about the broader sport brands and athletic apparel markets. Who are the biggest players, and what’s the market look like? We put together a new viz to find out. We got our data from Forbes, which publishes an annual list of the most valuable companies in almost every conceivable industry. We placed each company inside a rectangle corresponding to its market value, then we added logos and the valuation as a quick reference. This creates a snapshot of the entire market at one glance. There are some obvious reasons why looking at the data in this way is better than a boring bar chart. 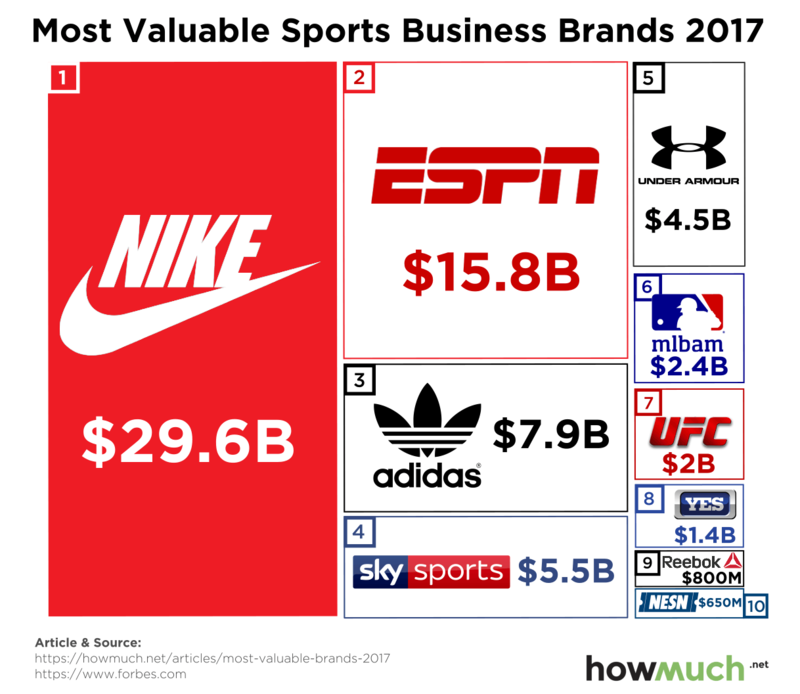 Nike dominates the sports brand market with a value of $29.6B, accounting for 42% of the entire market capitalization. The second, third, and fourth largest companies similarly make up a combined 41% of the market. In other words, sports brands tend to be very top-heavy—dominated by a few large companies, with no other brand topping $5B. That’s right—four companies control more than 80% of the space. So what might this chart look like at the end of 2018? It’s hard to say with so much disruption going on in the economy. When it comes to the athletic apparel market, Adidas and Under Armour have a long way to go before they can seriously challenge the top company. Nike has a lot of advantages being the largest, especially since they recently returned to double-digit earnings growth. The second largest company, however, faces a more uncertain future. Disney actually owns ESPN, which is bundled with other popular channels. That means if you want cable TV, you have to get ESPN. But since cable bills keep getting more expensive, more and more people are cutting the cord in favor of streaming services like Netflix. All of this means that ESPN’s recent round of layoffs probably foreshadows more difficult times for the network. Let’s take a step and break things down. Here’s the data in a simple list, from highest to lowest valuation ($ M). If your New Year’s resolution calls for going to the gym more, take a look around the next time you’re there. We bet you’ll see a lot of people wearing Nike outfits, and odds are that ESPN will be playing on the TV in the corner. That is, unless your treadmill has Netflix.